[By Nick, Seasonal] Hi my name is Nick and I hate the holidays. I also hate the fact that companies are putting out so many holiday products before Thanksgiving has even happened. I mean, I was seeing candy canes and fruit cake before Halloween even happened. 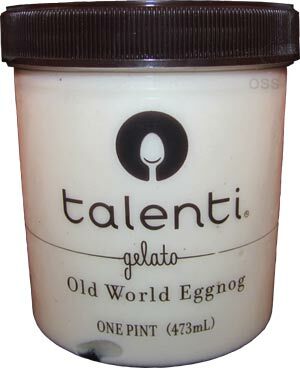 So with reluctance, I picked up Talenti Old World Eggnog Gelato. Sure eggnog is something that can go with Thanksgiving but I associate it with the Christmas season. Even the old packaging hinted to it being tied to that time of the year. Honestly, I've never had eggnog in my life. The name has always been too unappetizing to me. My memories only go back to my Uncle spiking my Grandma's glasses every Christmas. Technically I did try Edy's version last year and that was awful. Hopefully Talenti can inspire me to seek out the real deal, that or make me never want to try it at all. This one isn't all that surprising. You've got a milky white gelato with specks of spices about. And the gelato tastes exactly as it looks. The gelato has a strong milky flavor profile to it. It is eggy to an extent but in a french vanilla kind of egginess. It actual kind of reminds me of a custard in flavor and I'm really enjoying it. The nutmeg adds an extra bit of flavor but nothing overbearing or off putting. 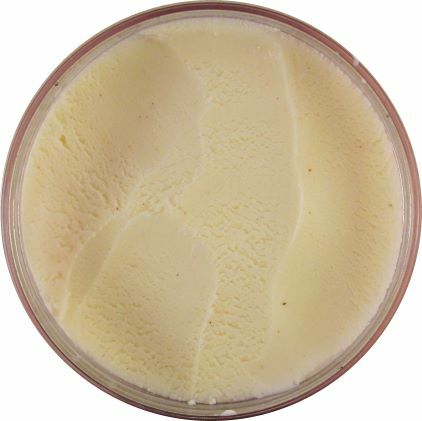 It's really just a milky, creamy gelato with notes of nutmeg here and there. Nothing that's going to blow your mind by any means but good and satisfying. It's way better than my experience with Edy's, that for sure. While it still doesn't put me in the holiday mood, it does make me want to try the real deal stuff now. Good job, Talenti! You're two for two this year with holiday flavors for me. Now I need to find their Peppermint Bark flavor Dubba reviewed last year. I wanted to try this, where'd you find it? Dana, I found it at our Whole Foods on Wolf Road. I saw both of them at safeway yesterday, I picked up peppermint bark. when I was a kid, the only way I would drink eggnog was with sprite. ha! Jamie, I don't think I've ever heard of eggnog and sprite let alone any other soda aha. Thanks. I tried ShopRite first since they're having one of their 2.88 sales and found it there. Dana, does shoprite have the peppermint bark yet? I remember one having a label for it but nothing stocked there. They did. They actually didn't have any Eggnog out, but some employees wandered by and offered to get some from the back for me. 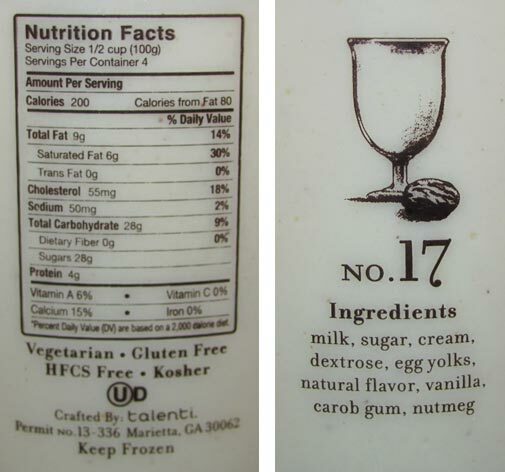 But they had a bunch of the peppermint on the shelf (at least on Wed). Thanks, heading to the store now to grab one while the sale is still going aha.